Queen of East and West Badaling, originally uploaded by xt1. Fay gave me the great wall for Christmas. 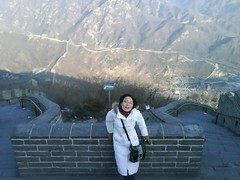 We took a taxi out to Badaling and walked up the shorter eastern section first. In december we had the wall practically to ourselves. Lovely and not too cold in the sunshine. After finishing the trip down to the bottom, we chose to attack the steep western section instead of going back to the taxi. The wind picked up, the sun was hidden by the ridgeline. Thus began a long climb up, one watchtower at a time. ‘This one will be the highest! This time for sure!’ only for another set of stairs to appear around the corner. Finally we reached the summit. The view is pretty impressive. Now i just hope i can walk tomorrow. King and Queen of the Great Wall – we are even more impressed by Stephen Robert’s achievements, having tasted a bit for ourselves.